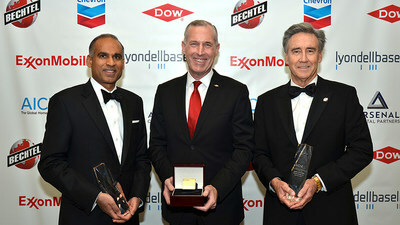 HOUSTON, Dec. 7, 2017 /PRNewswire/ -- LyondellBasell (NYSE: LYB), one of the largest plastics, chemicals and refining companies in the world, was honored by the American Institute of Chemical Engineers (AIChE) for inspiring the next generation of engineers during the 2017 AIChE gala held in New York City. The special recognition commemorates the company's support of students in their pursuit of knowledge in the fields of Science, Technology, Engineering and Math (STEM). "Our future depends on the next generation of innovative scientists, skilled engineers and highly trained systems operators," said LyondellBasell CEO Bob Patel. "We are proud to support programs that encourage our best and brightest to pursue a career in a sector that is advancing the positive future we know is possible. " In addition to providing financial and volunteer support to schools working to improve STEM education in the communities where the company operates, LyondellBasell also supports workforce development and job training programs at colleges and universities. In accepting the award, Mr. Patel reflected on the profound technological advances in the industry and pointed to the exciting career opportunities available due to significant growth in the U.S. chemical sector. He noted that young engineers are drawn to careers that make a tangible difference in the world, adding that the chemical industry is advancing solutions in modern healthcare, helping to deliver clean water, and reducing emissions by light weighting vehicles. "This industry is leading the charge in helping to solve some of the world's most daunting challenges," Mr. Patel said. "We have a lot to be proud of." The AIChE gala raised approximately $450,000 to support programs that strengthen pre-college STEM education and foster a diverse and inclusive engineering profession. "Attracting and preparing tomorrow's chemical engineers — and promoting an inclusive workforce in which they can all thrive — are essential if we are to successfully respond to global challenges," said AIChE executive director June C. Wispelwey. "Our gala honorees, through their dedication to early-education, are examples to which all employers of engineers should aspire."